A variable Speed of Light is supported by the fact that all direct measurements of that speed are basically flawed, because the “meter per second” is proportional to the Speed of Light. Since it is impossible to measure the Speed of Light directly, any variations of it can only be obtained in an indirect way. It will be shown that the recent Supernovae data are in very good agreement with a universe that is slowly expanding exponentially with a Speed of Light that falls over time, inversely proportionally to the expansion of the universe. It will be shown that the definition of the angular and standard impulse momentum has to be modified to get a consistent expansion of the universe. And that all clocks run inversely proportionally to the red-shift z + 1. General Relativity remains valid even with a varying Speed of Light and also Quantum Mechanics is unaffected. It is essential that when making a measurement to make sure that the two quantities involved are independent of each other. When the two quantities are shown to be proportional to each other, one always obtains a constant value . It was shown that the “m/s” is proportionally to the speed of the electron going around the proton. The latter speed equals the fine-structure constant α times the speed of light. K. Webb et al. have shown that α only changes little over most of the time of the visible universe. Hence measurements of Speed of Light are basically flawed and invalid. There have been several publications in the past dealing with Variable Speed of Light (VSL) in cosmology [3-6]. Some of the models conserve the mass of the universe and therefore not the energy. And all let the value of the speed of light vary in m/s. The VSL scheme discussed in this paper will conserve the energy throughout. Angular impulse momentum and impulse momentum will also be conserved, but with some modification in the definition of these quantities in an expanding universe (this has to be done in any case!). And the measured value of the speed of light is constant. So the apparent speed of light is constant! It will be shown in Section 2, that the Hubble Law fits the Supernovae data in an excellent way when a varying Speed of light is taken into account. This then automatically leads to a slowly expanding universe, with an expansion that is exponentially in time. Such an expansion is structurally very different from a power scaled model  leading to a very different universe. Although for small red-shifts the exponential expansion follows a power scaling a(t) = (t/t0)n with n = 1/2 when c(t) = c0/a(t) and n = 1 in case c is really constant in time. A power scaling would then lead to a very dense universe (ρ > ρcr) in the case of the VSL and an empty universe for a constant speed of light. Section 3 will demonstrate that the present definition of the angular impulse momentum leads to orbits that are not proportional to the expansion of the universe and that in order to make a consistent expansion one has to multiply the angular momentum with z + 1. Then any orbit, including electrons around protons, will scale with a(t). In Section 4, it is shown that any clock scales inversely proportional to z + 1. All processes will therefore run faster when going back in time. It is also shown that the Lorentz length scales with a(t) and therefore Relativity remains valid even for a changing Speed of Light. Over the course of time the Hubble Law has evolved to test models of our universe. Initially Hubble found that the expansion speed was proportional to the measured distance of the objects, leading to the relation of v = H.D. For small red-shifts z the velocity v = c·z with c the speed of light (see N. Wright  for more details). If one displays the measured distances of the Supernovae against the product of the redshift z and the velocity of light c one gets a curve that can be explained by an expanding empty universe or also by a flat dark energy model . Figure 1 shows the measured distances provided by A. Riess et al. as a function of the red-shift z together with the calculated distance representing an expanding empty universe. Our universe is certainly not empty, but these distances are close to those calculated for a flat darkenergy model . The first ratio of the wavelengths is due to the expansion of the universe and the second part related to the change in the speed of light. In case c(t) = c0/a(t) one gets a simple relation between a(t) and the red-shift z: . And of course c(t) = c0·(z + 1)1/2. In this way c·z = c0·(z + 1)1/2·z. Figure 1. 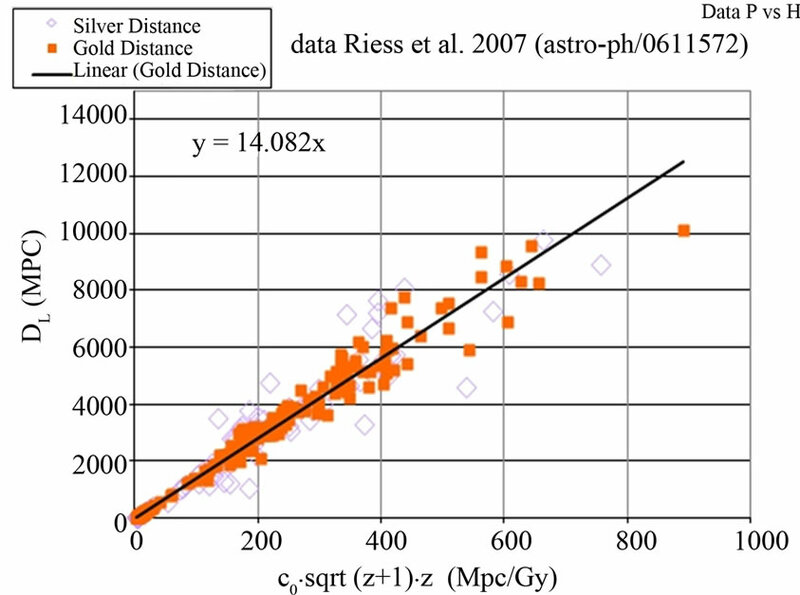 Measured distances of the Supernovae from A. Riess et al. against the measured red shift z. Also shown is the calculated distance (solid black curve) against z for an empty expanding universe a(t) = t/t0 with t0 = 14.4 G year. This calculated distance is very close to the one calculated for a flat dark energy model . Figure 2. The measured distance DL versus the product c(t)·z in which c(t)= c0/a(t). c0 is the speed of light at present. A remarkable good fit with the data is obtained with a characteristic time t0 of 14.082 G year. The Equations (2) and (3) are very similar. This suggests that indeed a(t) = (z + 1)–1/2. From which together with Equation (1) it can be seen that c(t) = c0·(z + 1)1/2 = c0/a(t). Then it follows that (z + 1) scales as e(1–x). Is the exponential expansion the only possible fit? In principle there are all kind of combinations of a(t) and c(t) possible that match Equations (2) and (3) and satisfy Equation (1). If one stipulates that a(t) = (z + 1)ɣ, one can by varying ɣ get a range of a(t) and c(t) pairs that satisfy Equation (1) and lead to the modified Hubble Law. For instance γ = –1 represents the expanding universe with a constant speed of light. But all other possibilities lead to a varying speed of light over time. The nature of the red-shift limits the range of gamma to values of: –1 ≤ ɣ ≤ 0. A universe that would not expand at all is represented by ɣ = 0. 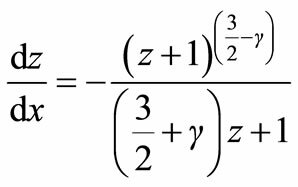 It should be noted that for γ ≈ –1/2 we have 1 – x ≈ ln(z + 1) with a relative error of (γ + 1/2) ln(z + 1). Indeed x = 1 or t = t0 yields z = 0, x = 0 yields z = 0.43, and x = –∞ leads to z + 1 = ∞. This latter does agree with the observations that the red-shift always increases when ­­­ looking back in time. For x = 1 one gets again z = 0, which is fine. This time however one gets z = ∞ at x = –1/3. First of all one should realize that the modified Hubble Law required that c(t) = c0/a(t) and that therefore already we have strong evidence for γ = –1/2. This then leads directly to: c(t) = c0/a(t) and z + 1 = e(1–x). It is the most straightforward relation that we can extract from Equations (2) and (3), but in principle it does not exclude other options discussed above. The “obvious” connection leads to an expansion growing exponentially in time: its scale factor is a(t) = exp[(t/t0 – 1)/2]. The growth is slow with an e-folding time of 28.2 G year. Thirdly as shown in the discussion in Section 5, there is supporting evidence that the sizes of the galaxies scale as (z + 1)m, with –1 < m < 0. 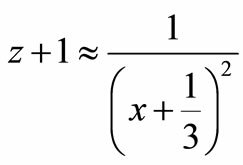 So that γ = –1/2. It is interesting to note that for small z, (t close to t0) one can expands a(t) and obtains a power scaling of a(t) ≈ (t/t0)1/2 . This would be the power scaling for a dense universe with ρ > ρcr the latter being the critical density at which the expansion of the universe is just not stopping . So by letting the speed of light relax over time the universe can have density compared to the power scaling of a(t) = (t/t0) which fitted the data so good for the constant speed of light model, but had zero density power scaling. An exponential growth is structurally different from a power scaling. A power scaling has a beginning at t = 0, an exponential growth has no beginning (t = –∞ is the start of all) and it has no end. t0 is just an e-folding time for (z + 1) and 2*t0 for a(t). But for sure the beginning and the end of the universe are both well outside the measurements. It may well be that the beginning was linear and the end will be in a saturation state, in this case the exponential expansion can no longer be applied. The quality of the fit of the exponential growth model to the Supernovae data is remarkable good. This is shown in Figure 3. There is no systematic difference between the measured distances and the calculated one. In the case for the zero density power scaling  there is a positive difference. An accelerating dark-energy model was required to explain this difference. An expansion accelerating in recent times is of course in agreement with an exponential growing expansion. But the latter came “naturally” out of the measured data itself. Figure 3. The relative difference between the measured and calculated distances. 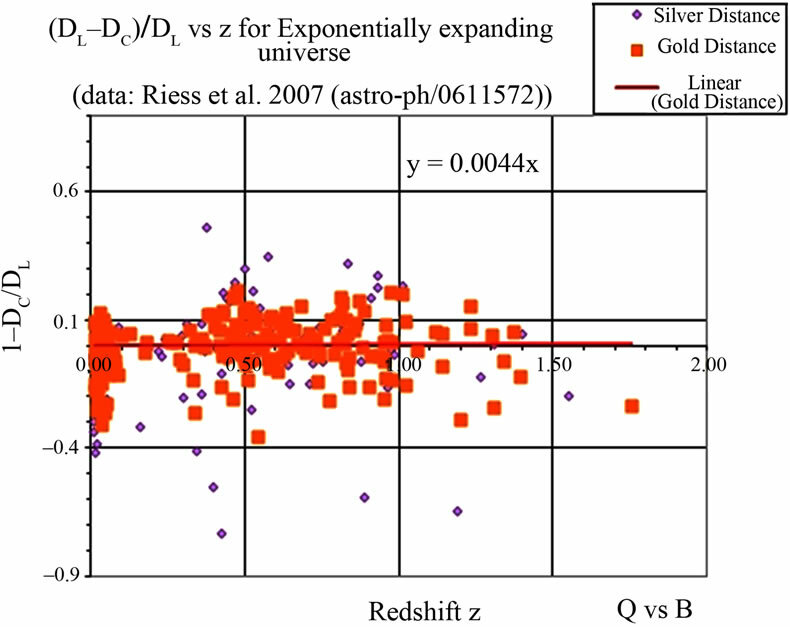 The red line is the straight line fit to the Gold data of A. Riess et al. Note: z = 1.755 is 14.5 G years ago. It is clear, that an exponentially growing expansion needs an “explanation” too in the form of dark energy that drives the growth. It is necessary to check whether conservation laws remain valid in these changing conditions. It should be noted that this section is valid for all combinations of a(t) and c(t), i.e. whether the speed of light is a real constant or not. With changing a(t) and c(t) energy is thus conserved if the ratio of v/c is conserved, since from relativity mc2 is conserved. This implies too that the relativistic energies are conserved. It is clear that for –1 < γ < 0 Equation (14) leads to serious problems with the expansion condition that r(t) should be equal to r0·a(t). With this definition of the angular impulse momentum, conservation implies that the scaling with the expansion scale factor a(t) is maintained for both planet orbits and atoms. The conservation of the electric charge has to be adapted to the expansion too. Also the orbit time for a planet around a star scales like that: Equation (17). In our case of c(t)·a(t) = c0 we get that G scales with the third power in c. But also in case of a constant speed of light one has to take into account that G still scales then with a(t). We can conclude that the clock of the pendulum, the orbit period of planets and the orbit period of the electron all change at the same rate in time: inversely proportional to the red-shift z + 1. Note that also for a really constant speed of light the clocks would still scale like that too. This dependence of the clocks has implications for the Lorentz equation and so on Relativity. It can be seen that Relativity is unaffected by the expansion of the universe. This just states that the Lorentz length too is multiplied by a(t). Since also all ratios of (v/c) are conserved, it follows that Relativity remains unaltered. Also Quantum mechanics are unaffected. It can readily be seen that all energy levels of the Hydrogen atom are in units of mc2α2, which remain unchanged. There exists tempting supporting data for the exponential scaling of the expansion. It has been shown that the galaxy size (in kpc) is a function of the red-shift z . 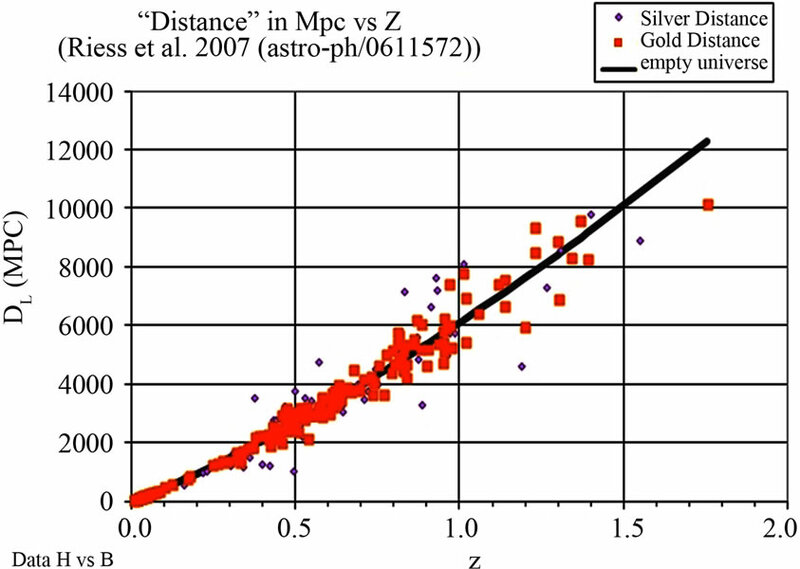 The data in Figure 5 of reference  show that the size of galaxies scales as (1 + z)m, with m between 0 and –1. For m = –0.5 the galaxies would scale as the scale factor of the expanding universe, namely as a(z) = (1 + z)–0.5. This then supports the exponential expansion. One can then conclude that starting from 50 Gyears ago (z = 5) the universe has been expanding exponentially. The exponential scaling law gives a very good match to the Supernovae observations. Exponential expansion requires a driving force. Dark Energy must be there. Power scaling laws are not very suitable to describe the evolution of the universe. Exponential expansion puts the Big Bang far back in time, but this is outside the measurements where we do not really know whether the exponential expansion remains valid. A modification of the definition of the angular impulse momentum is required in order to get a consistent expansion of the universe even in case of a constant speed of light. The clocks in the universe scale inversely proportional to the red-shift z + 1. The author would like to thank the Mediterranean Institute of Fundamental Physics i.e. Prof. A. Kavokin for his great interest in and support for this controversial topic. Also the author is much in debt to Dr. A. Riess for making the Supernovae data available in his publication. J. D. Barrow, “Varying Constants,” Philosophical Transactions of the Royal Society London, Vol. A363, 2005, pp. 2139-2153. J. C. Gimenez, “A Simple Cosmological Model with Decreasing Light Speed,” 2003, arXiv:astro-ph/0310178.